I hardly buy ANYTHING without doing extensive research on it first. Like. It's very possible someday you may see me in Wal-Mart, researching which type of spaghetti sauce is best. It's that bad. So I scoffed every time I heard someone say, "when you find the right wedding dress...you'll just know that it's the one." Because it didn't happen that way for me. 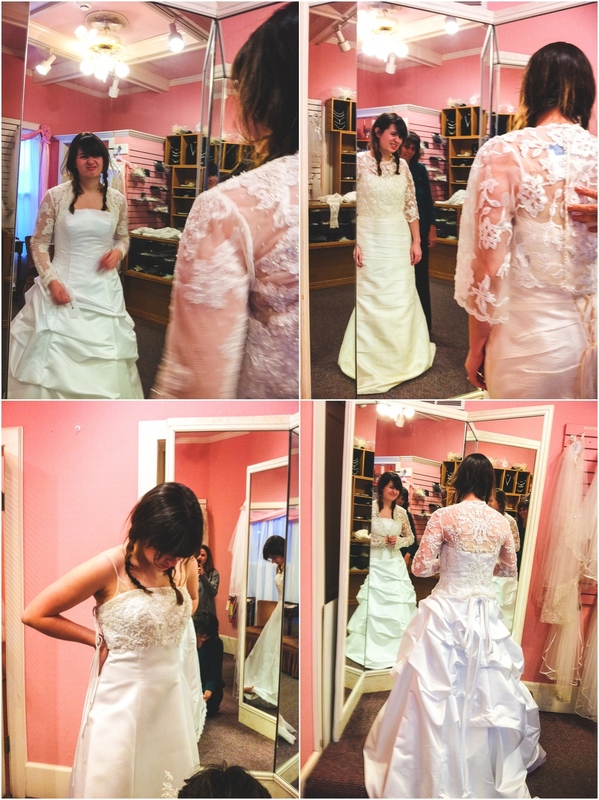 It took over a week or simi-obsessive research to pick my dress, and it wasn't the one I originally liked best. In fact, it wasn't even one that I was even considering. Most brides-to-be glow with excitement as they try on dress after dress, so I know that I probably stand alone but.... dress shopping was my least favorite part of the entire wedding experience. It was honestly at the bottom of list of things I valued, and it wasn't where I wanted to invest my time or money. I also had to get it figured out while I was in Rogers with my family for Christmas vacation since our engagement was fairly short and dresses usually take several months to come in. I came to terms with the fact that I have simple tastes and I feel ridiculous in big, poofy, elaborate dresses. I think they're beautiful on other people, but.... I just felt silly. After much debate, I settled on a dress that wasn't even initially an option. There were no magical fireworks going off in my head as I "said yes to the dress". Just the satisfaction of knowing I made a well-thought-through decision that I would be happy with. Romantic, I know.